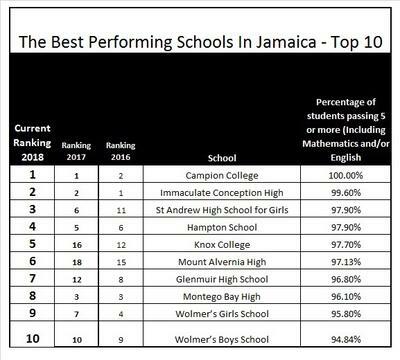 We shared the results of the 2018 Jamaican High School Rankings here, and it created quite a stir! Some of the big guns fell off but some new ones emerged! What say you? Do you agree with the results? Do you think they represent the efforts, leadership and potential of the schools? I'd love to hear. Please be sure to share your feedback here. To return to the 2018 rankings, click here. The ranking seems to cover the top performing school. Is it possible for me to view the entries list as the school that I am interested in falls in the lower part of the list. Thanks for your cooperation and please continue the great job. What about the ranking of the other schools. They are important too. I believe they are the most important ones because they get students who can barely read or cannot read to pass their CXC exams after working with them. Who get students with averages below 50% and create miracles with these children. Big up to all the schools that fall below 45.